Quite early in the process I stripped out everything in the original electrical cabinet and removed the mounting panel to make it easier to mount all the new stuff. 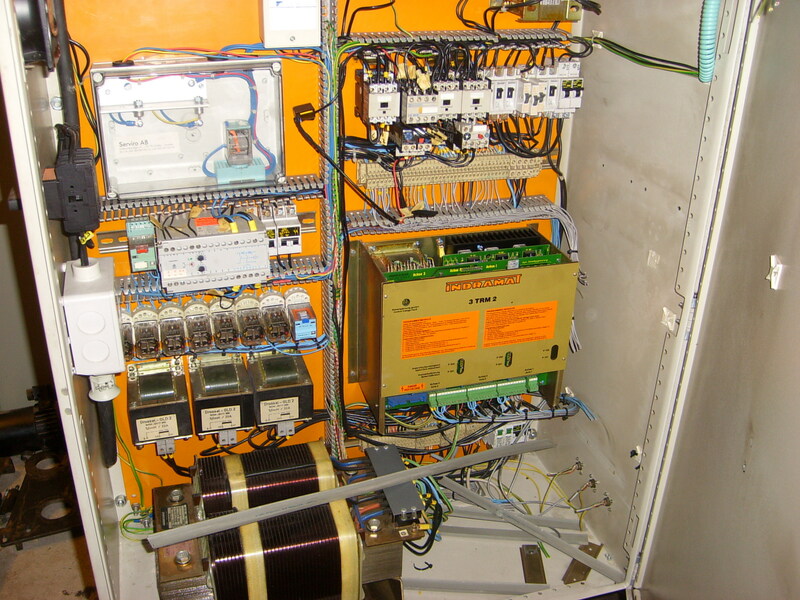 Circuit brakers, contactors, relays, resistors, servodrives, spindle drive, break-out-board etc etc. Pretty basic stuff here so far. Fuses for the various powersupplies, VFD, and computer. Contactors and power resistors for the softstart circuit of the main transformer and inrush limiter for the main filer capacitors. Two of the three remaining resisotrs are for the powerdump circuit and the third is a bleeder that quickly discharges the powersupply capacitors. 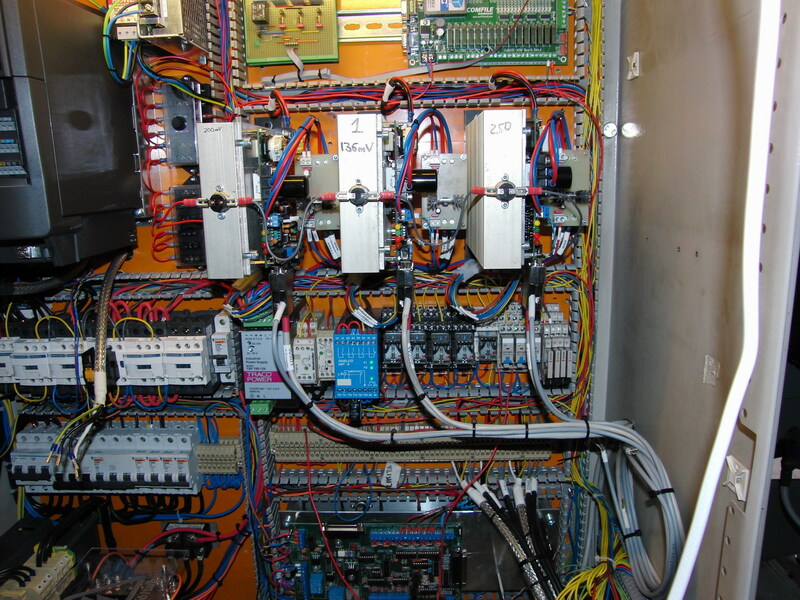 A 24VDC powersupply for the control voltage, a proper E-stop relay (the blue box in the middle) and a row of terminals for interconnections. 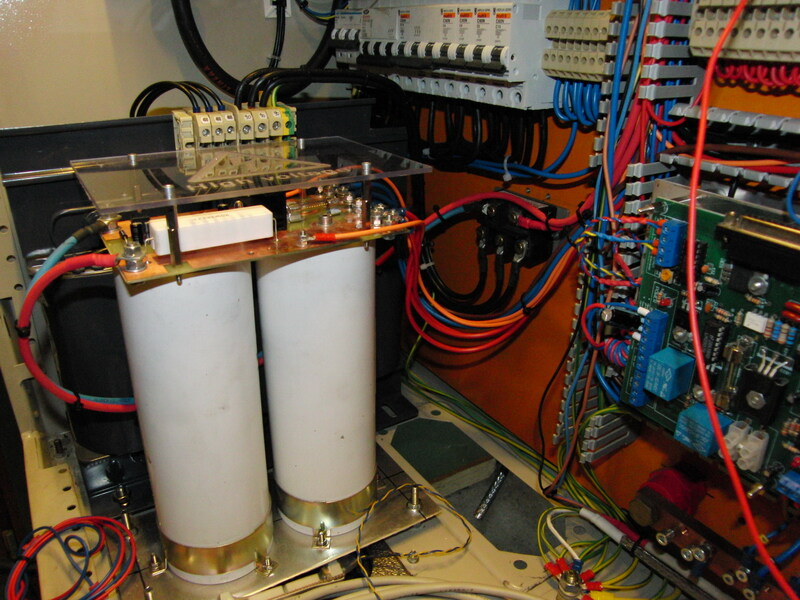 The main powersupply transformer3-phase rectifier and filter capacitors with the powerdump circuit on top. Basically I'm just testing the softstart and E-stop circuits. 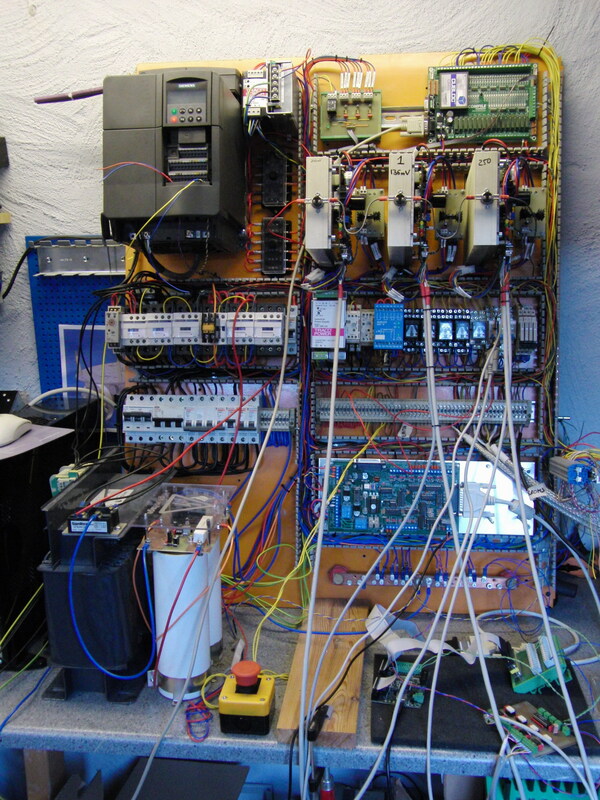 Here you can see that I've removed the VSD-A drives and installed (2 out of three) HP-UHU drives instead, the VFD for the spindledrive have been mounted, break-out-board, CUBLOC PLC for the control-panel and various other things. You can also get a glimse of the control panel I designed for this project. The HP-UHU servo drive have a combined fault input/output. If the fault I/O on all the drives are connected together they will all stop if any one faults. This is nice and all but the problem is you have no way of knowing which one that caused the fault in the first place. So I designed a circuit that with the help of the CUBLOC PLC and some ladder logic latches the fault state of the offending drive and then stops the others. 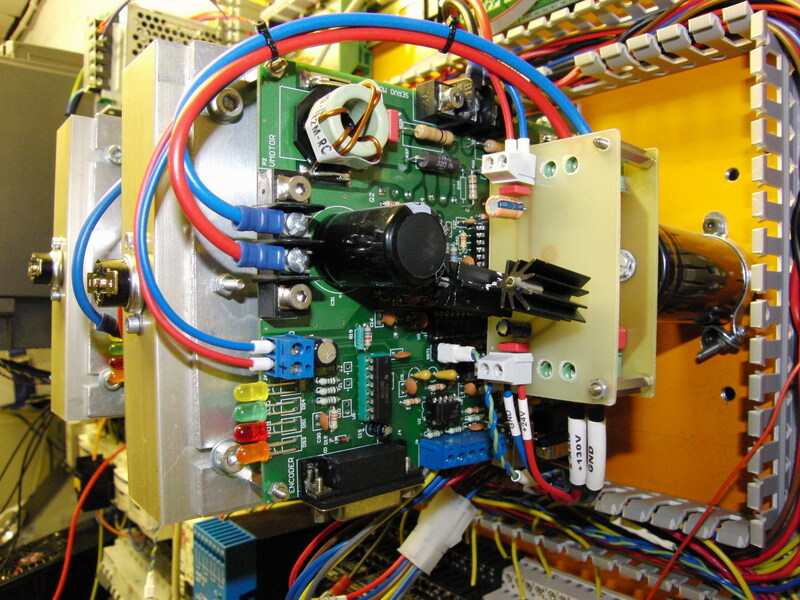 The CUBLOC is connected to Mach3 via MODBUS so I can make Mach3 show me which drive it was that caused the fault. Here's a closeup of another little board I made, or two actually. 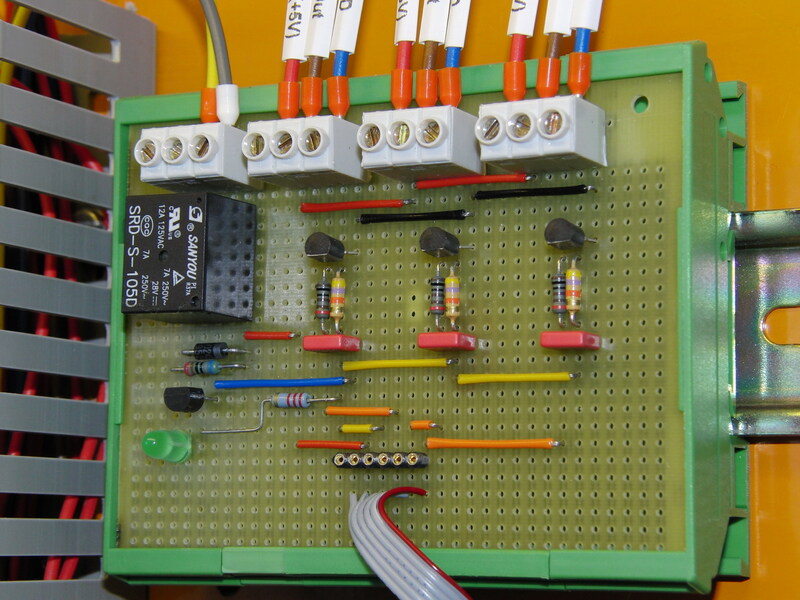 The HP-UHU needs 15VDC for its low voltage circuits. I already had 24V and 5V powersupplies in the system and I couldn't really find an affordable 15V switchmode supply for DIN-rail mounting so I made a couple of PCB's with a 7815 regulator and some filtercaps. 24VDC in, 15VDC out - works fine. The lower one of the two PCB is a filter for the motor power supply. The wires between the power supply and the drives are quite long so I wanted to put an extra filter cap as close to the drive as I could to help the internal cap share the ripple current. The PCB also houses a fuse with an antiparallell diode and a MOV. The diode lets current go from the drive to the powersupply in case the fuse blows and the MOV together with the capacitor hopefully clamps the voltage spike that develops when the fuse blows, protecting the drive. I haven't had a single fuse blow on me yet so it's still unkown if it works. These two photos shows pretty much the same thing. The one on the left side is the one of the last ones I took before the panel went back into the cabinet on the machine. 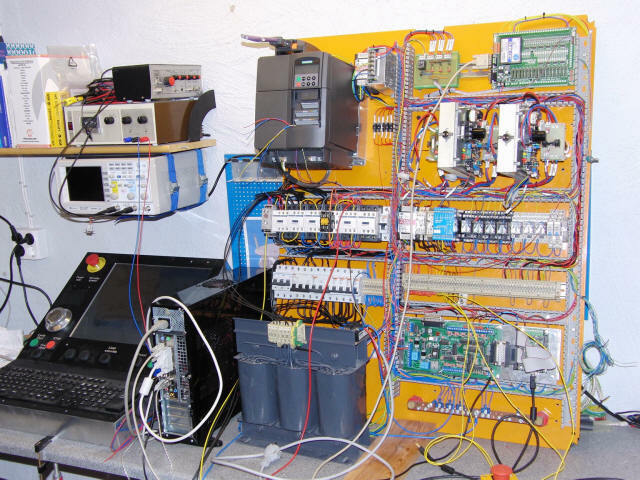 I had it like that for quite some time during testing and developement of the control panel, PLC code etc. The right hand photo shoes the panel mounted inside the cabinet. I installed a fluorecent light in the top of the cabinet to make it easier to work with it. 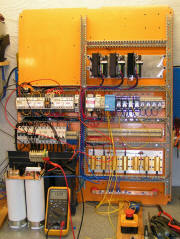 Next step was to install the transformer, rectifer and filter capacitors for the motor power supply. They'll be mounted pretty much as they are in the left photo. Here are two closeups. 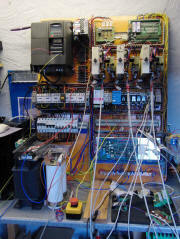 To the left, the filtercaps and powerdumps circuit with the transformer in the background. You can see the three-phase rectifier mounted to the panel. I think and hope that the panel will provide enough cooling for the rectifier, I'll have to keep an eye on that once I start running the machine. The right hand photo shows the three servo-drives. 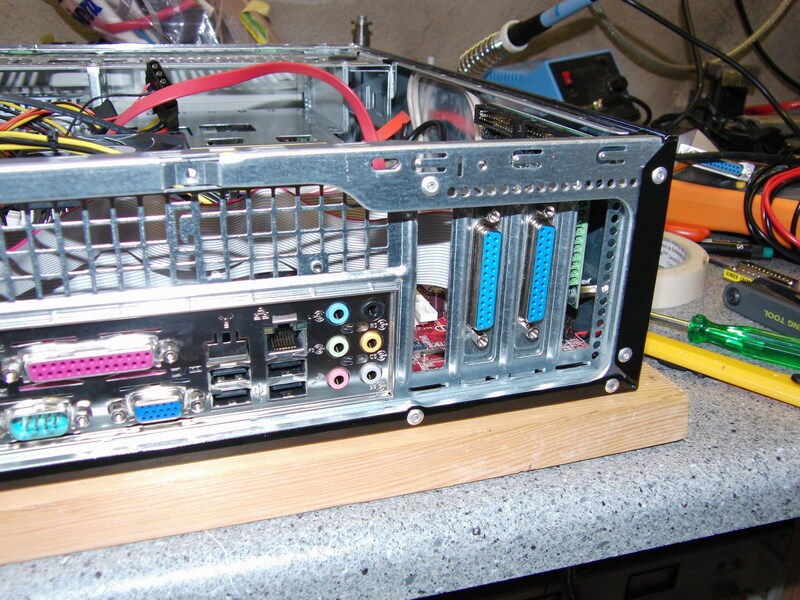 Encoder cables coming in at the bottom, power coming at the "front" and motorcables going out at the top. 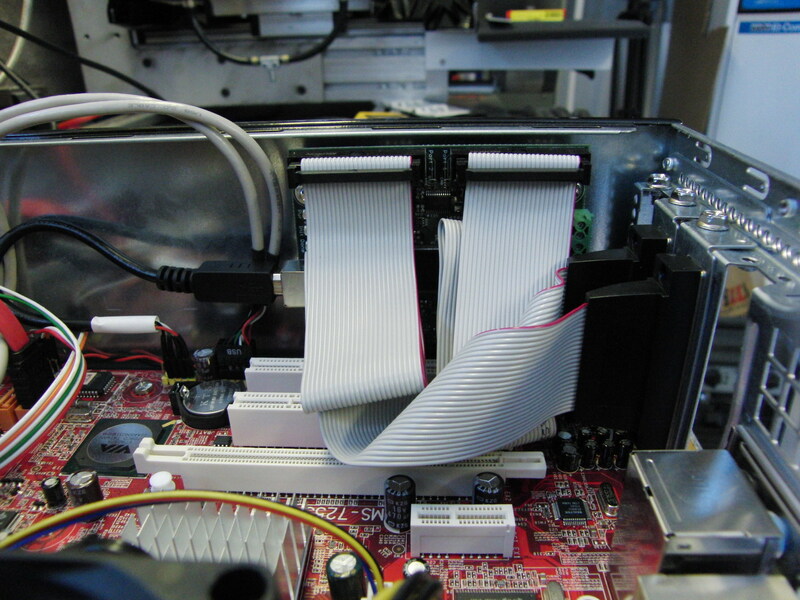 I've mounted thermal switches to the heatsinks, wired in the E-stop chain so it shuts down the machine in case the heatsink temperature goes above 60°C. 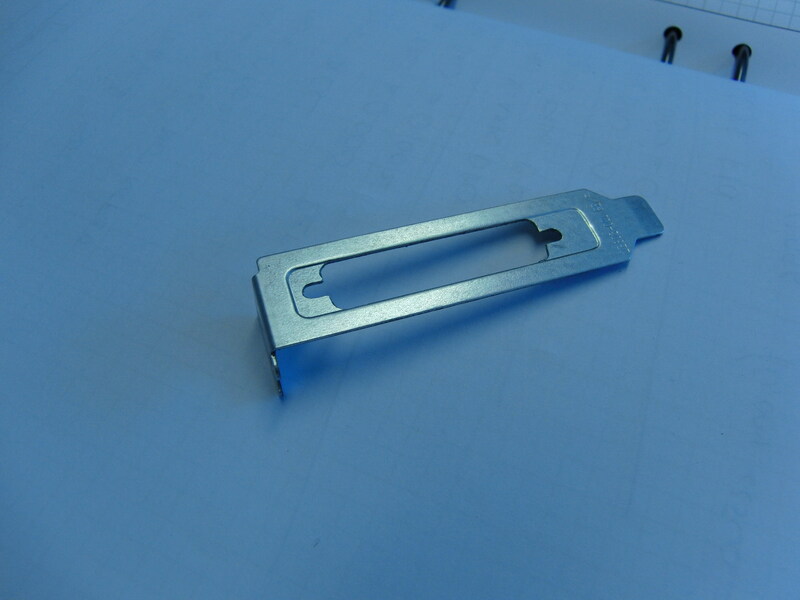 The same type of switches are mounted on the heatsink for the power resitsors and the servo-motors have internal thermal switches. They are all wired to separate relays and the relays are then wired to the E-stop chain as well as to the CUBLOC PLC, that way I can let the PLC tell Mach3 what caused the E-stop in case it happens. 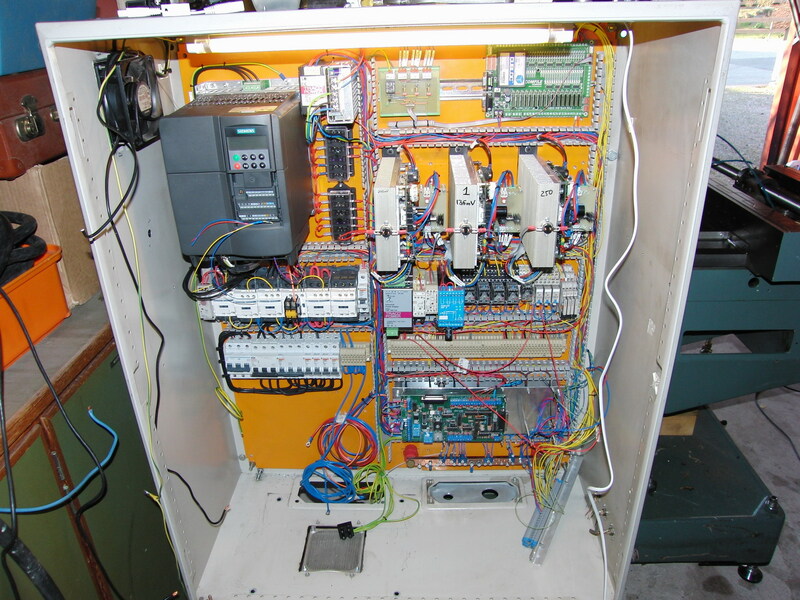 Servodrive overheat, servomotor overheat, resistorbank overheat etc. 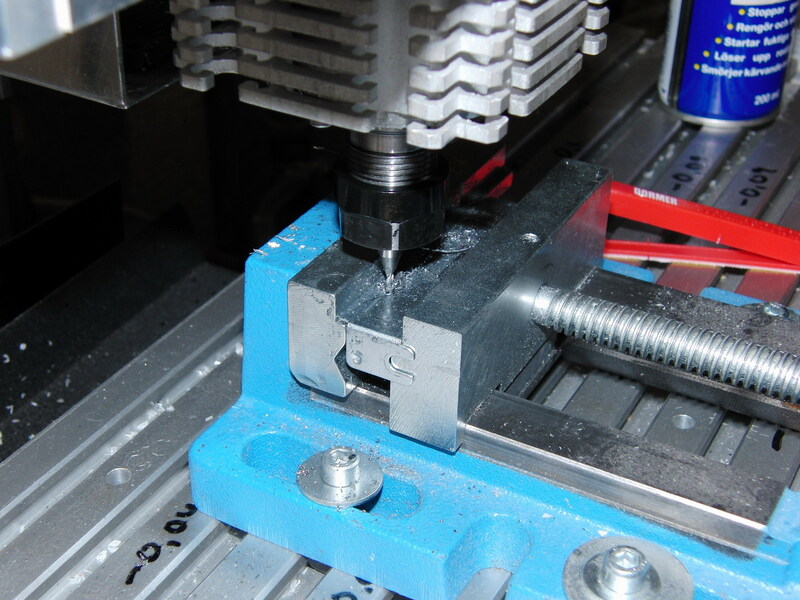 This move provided a nice shielded place for the somewhat sensitive Smoothstepper. I cut off a USB-cable and slodered a new female header to it making it short and nice, right from the USB-header on the motherboard to Smoothstepper.